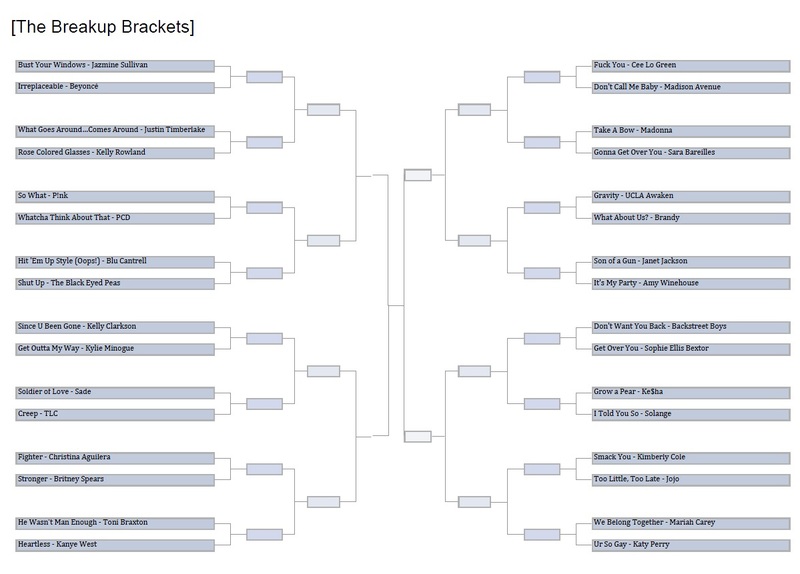 Vertigo Shtick March Madness: The Big Bad Breakup Songs Bracket Game! Art imitates life. We're all agreed on that truism, right? Art also imitates art, sometimes more than others, as seen with recent Gaga! Madonna! J.Lo! Lambada! Rihanna! David LaChapelle! Glee! Glee! Glee! Glee! (etc.) drama, just as life imitates life (compare the non-music biz stories of Britney Spears 2005-09 and Christina Aguilera 2010-present...oh and Whitney Houston c. late 1990s-2010(?) and Mariah Carey 2001-05) and life, in its way, imitates art (see "The Rachel," the eerie prophecy of Britney Spears' 2005 song "Mona Lisa"). This is all really just my little advance loophole/disclaimer at the front end of a fun new event for the blog inspired by an idea for which I can't claim absolute credit...after all, art imitates art. 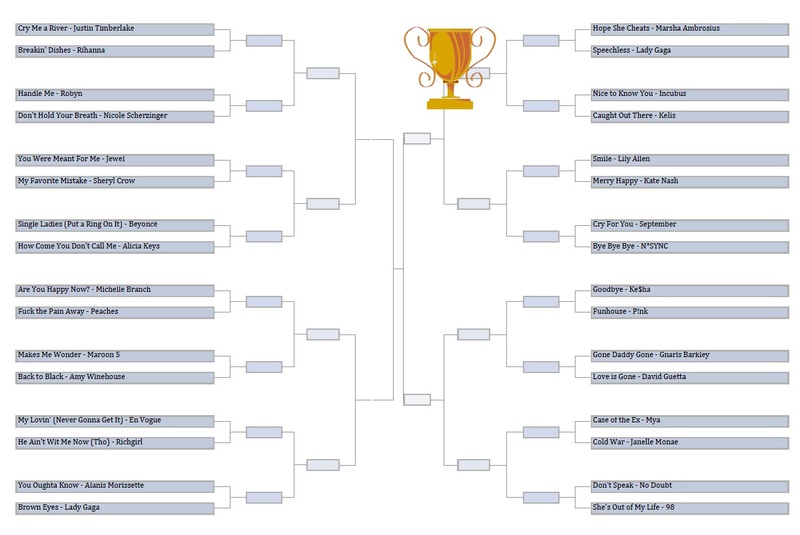 You may know I occasionally contribute to Cover Me, arguably the top cover songs blog on the web; this year the blog has launched a fun, reader's choice bracket of Beatles covers to coincide with the fabled NCAA March Madness tournament now underway (it's been named "Moptop Madness." Isn't that droll and funny the way "The Beatles" is a droll and funny band name?). It's a fun series that's great for discovering new music, reader participation, debate, and good old-fashioned indie/hipster music snobbery (my two contributions to the bracket were wiped out in the opening round), and as a blog still very much in a buildup phase in terms of readership, I thought something along the same lines might be a fun way to get folks involved and interested in something other than basketball or pointless office pools. But what to use for a theme? Ah, here's where art imitates life. Have you ever experienced the unique joy of the breakup of a lengthy relationship (especially one not by your choice)? Well, I've recently joined the well-populated club, and while it's not so much fun being a new member, it's been comforting to realize how many people, including many of the artists I so admire, have also earned membership at some point or another. The bonus of admiring so many recording artists is the blessed tendency of said artists, in times of heartbreak and/or end of relationship-related disarray, to SING about it. And that makes us all feel better in the end, really, somehow or another, though different tactics work for different people at different times (it's entirely reasonable to shift from rage to mourning to empowerment to drunkenness and back in the span of a day...or a conversation) but what can't be denied is that nothing seems to cure the blues like singing a little blues. So, I have assembled 64 of the best pop tunes of the last decade and change that deal with the murky swamp that begins the moment the relationship ends, and not a moment sooner (what good does that do?). There are some iconic songs of anger and frustration, others sassy sendoffs to someone deserving to remain in the past; some simple mourning, and a few more optimistic declarations of moving on. 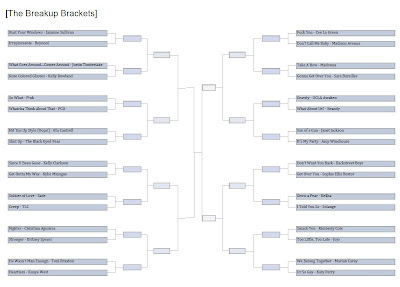 For the most part, the bracket placement is the random product of iTunes' shuffle function, with a mere couple of minor adjustments in the interest of keeping this interesting for the long haul. Each day I will post two new matchups, and readers will have 72 hours to log their votes for the one they prefer for whatever reason that might be whatsoever. Those with stronger opinions are encouraged to use the comments to sway voters in their preferred direction! In the end, of 64 great breakup songs there will be one to wear the crown, and in the meanwhile you'll get a chance to listen or re-listen to several dozen great tunes that are bound to lift the spirit even for those experiencing the bliss of intentional single life or the presently uncomplicated romantic pairing (or grouping...we don't judge here). Plus, if all goes to plan, your humble author will emerge from this project having successfully weathered the dismal storm of a breakup's immediate aftermath, and ready to strut fiercely through the rain while dancing suggestively with metal chair a la Ms. Spears. 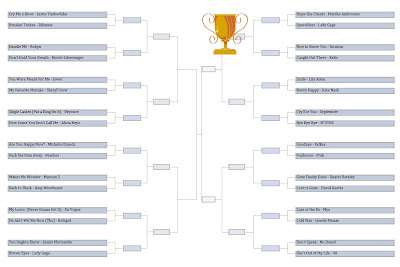 Gather round, grab the Grappa, and start the cleansing ritual: it's March Madness here on Vertigo Shtick, so let The Big Bad Breakup Bracket tournament begin! Follow @vertigo_shtick on Twitter or the Vertigo Shtick Facebook page to keep up with the new matchups that will be posted each day, since voting only remains open for 72 hours on each one! See the full brackets below (click to enlarge)!